This blog post explains what it means to “go primal”, what the motivations are for doing so, the foods to include and exclude and what you can expect to gain by following this lifestyle. I use the word “lifestyle” intentionally because it is more than just a diet or way of eating. It incorporates principles for exercise, sleep and play as well. More on that in future posts though. Do you often feel tired and lethargic? Do you suffer from bloating and cramps? Do you feel the need to eat every couple of hours? Is there a spare tyre inflating around your middle? Is your complexion full of pimples or acne? Are you often moody or depressed? Are you often sick with colds and coughs? Are your blood test results heading in the wrong direction? Keep your answers to these questions in mind as we delve deeper into this topic. Our ancestors, those that lived between 10, 000 and 2.5 million years ago were genetically almost identical to us, bar a few minor mutations. These minor differences however, have had no impact on the basic ways we all metabolize food or respond to exercise. Humans who lived during the Palaeolithic era were stronger, leaner, taller and healthier than we are today. So what has gone so terribly wrong? Why are we fatter, shorter and sicker? 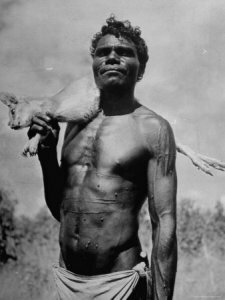 Photo to the right: Historical Aboriginal hunter gatherer. Lean and ripped. Let’s take a closer look at what they ate. Our very distant relatives ( and I mean very distant…) were hunter gatherers, meaning that their diets consisted mainly of meat, fish, nuts, fresh fruits and vegetables. For 2.5 million years our ancestors thrived on a Paleo diet. For 333 generations, every human being on Earth ate this way. This diet has been built into our genes. It is how nature intended for us to eat. 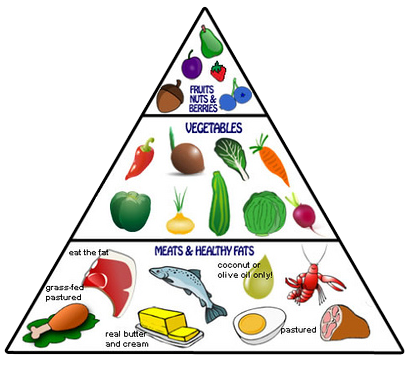 It is the diet that enabled human beings to evolve and survive in the harshest of climates and conditions. If you had to put diesel into your car that was designed for petrol – the consequences could be pretty disastrous. Well the same applies to our bodies, except our equivalent of “diesel” are grains, sugars, trans fats and processed food. 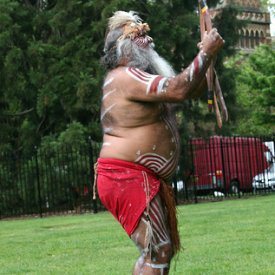 Photo to the left: Modern day Aborigine following a Western diet. Quite a stark contrast to his predecessor. No-one ever got healthier eating burgers and fries, pizza, sugary breakfast cereals or fizzy drinks. I am even going to convince you in my next post that whole grain bread is poison to our ancestral genes. Eating these foods that our bodies have not been designed to eat is making us sick. Our genes have simply not adapted or evolved fast enough to cope with the onslaught of such foreign foods. Heart disease, diabetes and obesity have reached epidemic proportions all around the world. What’s even worse is that our children are getting sicker too. So, are we to don our loin cloth, grab a spear and head out into our urban forests to hunt some deer for supper? How about some foraging for berries and roots in the park. Not likely! But if you can head off to your local supermarket, pop some free range eggs, meat (preferably grass-fed), fish (preferably wild caught) and vegetables and fruit (preferably organic) into the trolley, then you are half way there. Stop by the nuts section (preferably raw and unsalted) and then walk right past the bakery and cereal aisle. Pick up a bottle of quality olive oil, close your eyes and speed walk through the chocolate alley at the tills – then you are home and dry! Note that I have excluded rice, pasta, bread, legumes, sunflower/canola oils, biscuits, cakes and sweets. They are just not primal and shouldn’t make their way into your trolley – or hardly ever at least. I must admit that I still throw some cheese, full fat Greek yoghurt and milk into my trolley, which isn’t strictly Paleo but we don’t consume much and none of us seem to be lactose intolerant. I hope I have given you something to think about. Look out for my next post where I will go into more detail about why grains are not good for you. Posted on February 5, 2013, in Primal 101. Bookmark the permalink. 7 Comments. Excellent article Nicky very informative, love the visuals and your sense of humour! I look forward to the next ones! How quickly did you loose 10Kg’s and how soon did you notice the difference in energy levels, complexion and general feeling great? First few weeks were tough as my body detoxed. Headachy and not much energy but I have read that it is quite normal. After that my energy levels were chalk and cheese to before. The weight came off steadily over the last year. If I was stricter it would have been quicker. I still have quite a bit to lose which is never easy, but the most important thing is that I have my health under control and that should always be the focus of any eating plan. My skin was never too bad before, but I just feel that there is a glow that wasn’t there before! Reading your questions – only 1 apply’s. I look forward to further articles.